The current political climate has stirred many a playwright to tackle political themes and motifs in indie theater productions, and Vincent Delaney’s The War Party seems sprung from the brutal politics playing out on the American landscape and the politicians wielding words as weapons to the detriment the country as a whole. Presenting a play about a Republican protagonist to a New York audience is a bold choice, especially when said protagonist is immediately outed as a possible racist and homophobic bigot, but the play does not suffer inherently from this perspective. Rather, it is the playwrights heavy handed way of exposing her lead character as a bigot at the outset and then attempts to persuade the audience to empathize and sympathize with her that prevents the play from conveying any deeper messages. The War Party opens on an abandoned celebration – red and blue decorations litter the floor along with glossy campaign posters. Jessie, a college-aged volunteer returns to the party to snag a keepsake from the campaign, when she is confronted by Republican candidate Laura who is getting progressively drunker by herself following a dismal loss to her Democratic contender. After convincing Jessie to join her in her booze binge, Jessie proceeds to explain to Laura why she lost the campaign – opining on everything from Laura’s unwillingness to debate her opponent, her hair style and her refusal to speak publicly about her daughter’s death. Laura retorts with bitter and hurtful retorts, tearing the young volunteer apart (in the process, making numerous bigoted comments at her leisure and insisting on toasting the GOP). She is vile, moody, frustrating and it is difficult to see why Jessie continues to come back for more and more personal attacks by the candidate who she spent months aiding. As the play progresses, the candidate begins to let her guard down and, in doing so, reveals some painful truths about her family and herself that lead both Jessie and Laura to wrestle with frustrating reality of confronting a deteriorating political system or escaping from it. While The War Party delves into the toxic world of American politics, with its win at all costs mantra and paralyzing effect on actual governance, the play sets itself up for failure from the outset. Laura epitomizes a political villain (at least, in a pre-2016 world) — a bigoted and condescending woman who belittles Jessie and becomes downright violent towards her. While Delaney tries to add complexity to the character by revealing the recent suicide of Laura’s daughter and a life-threatening illness, these layers do little to absolve the woman of her odious past transgressions. None of this is aided by the fact that Laura’s daughter apparently disposed her mother and her mother’s political views, leaving the audience to consider just how big a role Laura had in her daughter’s suicide. 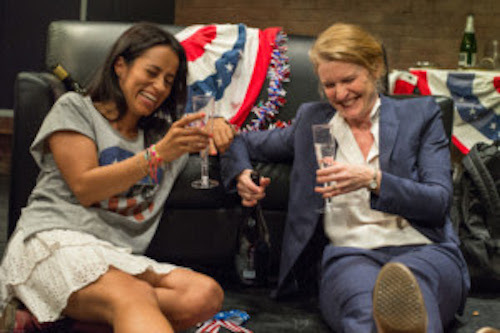 The playwright uses an apparition of Franklin Delano Roosevelt to draw out Laura’s insecurities and feelings about her political future, but the exchanges between the two characters are somewhat confused. Is FDR meant to be Laura’s conscience? An angel of death? A trickster devil trying to lure her to an early end? The choice to have Jessie ultimately reveal herself as an NPR reporter struggling to get her first big story is an interesting plot twist but by the end of the narrative, it is difficult to see why Delaney would resolve to help and put her faith in the abusive Laura. The small ensemble displays a great deal of talent in The War Party, maintaining the emotional whirlwind of a show with hot tempers, explosive confrontations and quiet reflections. Jennifer Piech draws laughs from the audience despite Laura’s oft-obnoxoius demeanor, and she does a nice job of bringing out Laura’s vulnerability and inner turmoil, but she hits a level of angry hysteria very early in the production that becomes exhausting. Odelia Avadi carefully balances Jessie’s apparent naivety with an aggressive self-assurance that can combat Laura’s verbal jabs. William Youman rounds out the small cast with a delightfully convincing take as President FDR – genuine, stately and charismatic. Ultimately, The War Party attempts to explore the political climate, and, perhaps, even suggest an (albeit unrealistic) solution to the fractions tearing the country apart, but the characters must themselves be less polarizing for the audience to internalize the message.